The other day I showed you two t-shirt dresses that I had made. I mentioned a third dress that had not worked out. When I make a major mistake, I always find it best to put the mucked up sewing away and do something else. The t-shirt isn't sitting as well as the other two dresses. It looks stretched but it's not. I think the reason the t-shirt is not sitting as well, is because it's cut much higher. Not sure why, but it's not too bad. I'm very happy with the underskirt and the way the lace and overskirt sits on top. This was just the effect I was after. This little dress will be joining the previous t-shirt dresses for the Hopeful Threads sew-along to support Dress A Girl Around the World. 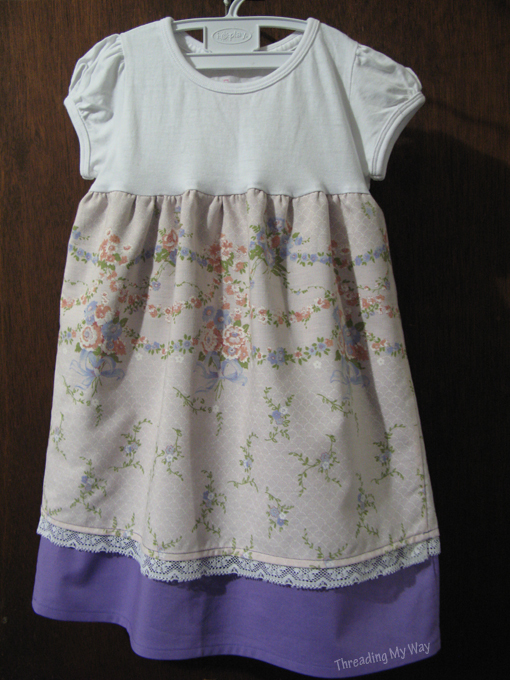 Head on over to Sew Delicious, to see the gorgeous peasant dresses that Ros has made for the sew-along. She has used such bright, fun fabric. Heidi, over at Grizz 'n' Dove, has joined in by making four lovely pillowcase dresses, with beautiful decorative stitching. I love it Pam! So exciting to see all these beautiful and unique dresses! I need to start walking away when I'm sewing something and have issues. I tend to try and plow through b/c sewing time is limited and it always ends up worse. Next time I'm following your advice and I'll come back to it later. Cute!!! I need to do this! What a sweet little dress! Thanks so much for sharing! So smart to let it sit and then come back to it. Turned out very nice. I think it looks awesome! Thanks for linking to Things I've Done Thursday! I love the underskirt--so cute! Thanks for sharing at oopsey daisy!